“Russia dumped 84% of its American debt,” blared a July CNN headline. Russian central-bank head Elvira Nabiullina said the sales were just part of “diversifying the entire structure of currencies.” But with the U.S. dollar accounting for two-thirds of global foreign-exchange reserves and most (non-intra-eurozone) international trade, dumping this much dollar debt goes well beyond prudent diversification. Still, the Russian central bank needs dollars, which it has always held mainly in the form highly liquid interest-bearing U.S. Treasuries, to stabilize the ruble through market intervention and to help its banks manage liquidity. Furthermore, Russian president Vladimir Putin has stated that “Russia is not rejecting the dollar” and is “not planning any sudden moves.” This doesn’t jibe with the media headlines. We therefore decided to explore another possibility: that the headlines are just plain wrong, and that Russia has not sold anywhere near that many Treasuries. Let us start with U.S. Treasury Department data on holdings of Treasury securities. These do indeed show an $81 billion (84 percent) plunge in Russian-held Treasury debt—from $96 billion in March to $15 billion in May. Other figures, however, suggest that Russia’s actual selloff was much smaller than this. One indicator is Treasury Department data that track sales, between U.S. and foreign entities, of long-term Treasuries—the sole component of Russia’s Treasury holdings that has dropped since March. From March to May, these data show just $35 billion of Russian sales, as the middle bar in the left-hand box above indicates. This figure, however, likely underestimates Russia’s sales somewhat. Russia may have sold some Treasuries to non-U.S. parties, or executed some sales through foreign financial intermediaries, that the data do not capture. Still, by this measure, roughly $46 billion in Treasuries remain unaccounted for. Russian data show a similar amount missing. Russia’s central bank reports that, between March and May, its total stock of foreign debt fell by $50 billion. Since March, however, dollar appreciation has lowered the dollar value of Russia’s non-dollar debt assets. We estimate that this explains about $7 billion of the decline, implying $43 billion in actual Treasury sales—as the rightmost bar above shows. This is $8 billion more than the U.S. data indicate, which likely reflects about $8 billion in Russian sales to non-U.S. entities, or sales made through foreign intermediaries. This leaves $38 billion in “missing” Treasuries. Where could they have gone? The most logical explanation is that Russia moved these assets outside of the United States to protect against U.S. seizure. The two most likely destinations would be Belgium, home to custodian bank Euroclear, and the Cayman Islands. So we looked at data from both. 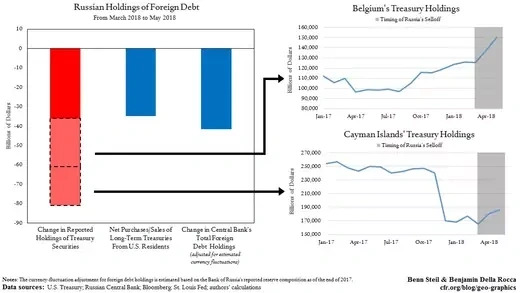 Sure enough, during April and May, as shown in the right-hand figures, Belgian holdings of Treasuries rose $25 billion, while Cayman Islands holdings rose $20 billion. That sum, $45 billion, is more than enough to account for the missing $38 billion. In short, Russia appears to have sold only about 45 percent of its Treasury holdings—substantial, but far less than the 84 percent the media is reporting. Sixteen percent remain registered as Russian holdings in the United States, and the remaining 39 percent, we believe, are being hidden in Belgium and the Cayman Islands. With U.S.-Russia tensions increasing, we would not be surprised by further such “offshoring” of Russian Treasuries in the coming months. Is Trump Right About the Strong Dollar? Not According to Our Mini Mac Index.